The Natural Series gas fire table collection by Homecrest offers elegance and timeless style for years of outdoor entertainment. Each table top is individually cast from reclaimed wood and then hand painted which creates a stunning natural wood grain effect. This fire table's base is made from durable light-weight aluminum with your choice of multiple powder-coat finishes. 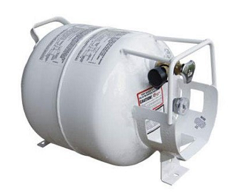 It comes propane tank ready but also includes a natural gas conversion kit for those who would like to connect to a hard line. The fire table includes a 10 lb bag of fire glass and your choice of table top and base color so you can create a table to match your design needs. Proudly manufactured in the USA, you can be assured that the Homecrest band name fire tables will not only add value to your outdoor living area but endure the test of time. *Note: Propane tank use for the 19” coffee height requires a horizontal tank that is sold separately!